The Africa Nubian kingdom of Nobatia (or Nobadia) had its capital at Pachoras (modern Faras), and was located in modern northern Sudan and southern Egypt. The exact date of its founding is not known, but it seems to be early, perhaps early enough to be an indirect continuation or re-founding of the Meroë Kush kingdom. 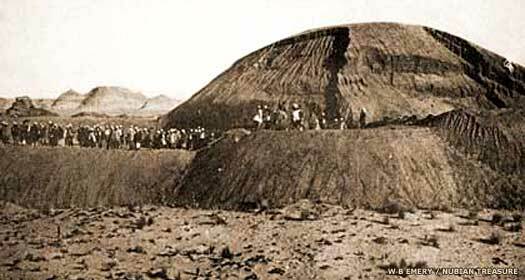 The traditional theory is that the old kingdom was destroyed during an invasion by Ezana of the Ethiopian kingdom of Axum. To contradict this, the Ethiopian account seems to describe the quelling of a rebellion in lands they already controlled. It also refers only to the Nuba, and makes no mention of the rulers of Meroë. However, no details of rulers at Meroë are known after about AD 350, making their survival unlikely. There is a possibility that the kings, or at least something of the royal family, moved to Pachoras and re-found the kingdom as Nobatia. Unfortunately, no records exist to document anything about the kingdom other than its last days. Details of the two hundred years from the fall of Kush to the middle of the sixth century are unknown. Nubia is inhabited by a people whom ancient geographers call the Nobatae (and have been labelled the X-Group by modern archaeologists, who are still at a loss to explain their origins). The Nobatae are clearly the heirs of Kush, as their whole cultural life is dominated by Meroitic crafts and customs, and occasionally they even feel themselves sufficiently strong, in alliance with the nomadic Blemmyes (the Beja of eastern modern Sudan), to attack the Romans in Upper Egypt. When this happens, the Romans retaliate, defeating the Nobatae and Blemmyes and driving them into obscurity once again. A Greek inscription by Silko at Kalabsha may be dated to around this time. Silko refers to himself as 'Basiliskos', or kinglet, of the Nobatae, and describes fighting the Blemmyes from Ibrim to Shellal and extracting an oath of submission from them. These would probably be the same Blemmyes who were defeated by Roman Emperor Diocletian in AD 297 when he called in a people known as the Nobate from the oases of the western Egyptian desert (on the fringes of Kush), to defend the southern frontier of the empire at Aswan. Christian. Last king at Nobatia? Tokiltoeton is primarily known from a foundation inscription at the fortified settlement of Ikhmindi in Lower Nubia. This is a heavily fortified settlement founded either late in the pre-Christian era or at the start of the Christian era. It contains two churches, suggesting occupation continues at least into Nubia's medieval golden age. The inscription suggests that Tokiltoeton is responsible for the fortification work. Christian missionaries from the Eastern Roman empire convert the Nubians. It is at this time, perhaps coincidentally, that records for Nobatia stop and those for Dongola seem to start, suggesting a relocation of the capital or a re-founding at a new location due to circumstances unknown. The kingdom of Dongola, which was located in modern northern Sudan and southern Egypt, is by far the best known of the Nubian successor states, but it still contains gaps in the record. It was one of a group of Nubian kingdoms that emerged in the centuries after the fall of the Kushite kingdom which had dominated the region from 785 BC to AD 350. The others were Nobatia, with its capital at Pachoras (modern Faras), and Alodia in the south, with its capital at Subah (Soba) near what is now Khartoum. However, Nobatia may have been an early form of the kingdom of Makuria (or, variously, Makouria, Maqurrah or Mukurra). It seems that a transfer of the capital may have occurred at the start of the seventh century, perhaps at the same time as the kingdom was converted to Christianity. The kingdom itself originally covered the area along the Nile from the Third Cataract to somewhere between the Fifth and Sixth Cataracts. It also had control over the trade routes, mines, and oases to the east and west. Its capital was Old Dongola (or Dunqulah), by which name the kingdom seems to be better known. The names of Dongola and Makuria are largely interchangeable, although Makuria appears to dominate after AD 652. Old Dongola was built in the fifth century as a fortress, but quickly developed a settlement around it which turned into a town. Note that dates are quite uncertain for most Dongolan/Makurian rulers. It was apparently during the early second millennium AD that Nubians, or people who spoke a Nubian-related language and were semi-nomadic, began to arrive in the Meidob Hills, in Jebel Meidob in the north-eastern corner of the Darfur region. The resultant Meidob or Midob civilisation flourished, although not to any extent which affected the rule of the region. The hills are a concentration of volcanic mounds and deep ravines, and the depression on the western side of the hills is known as the Malha Crater, which contains valuable deposits of rock salt and muddy salt. This crater also contains fresh water springs and a small lake, and the salt gathered by the Meidob inhabitants was sold to the neighbouring Arabs on the trade markets. Archaeological sites containing cities, stone barrows, and rock paintings are to be found all over the hills. The region's ruins, language, a tradition of matrilineal succession, and a claim by the Meidobis to be Mahas Nubians in origin are all usually offered up as proof of rising influence in Darfur by Christian Nubians. They probably migrated there from Kordofan rather than the Nile Valley, with Nile traditions being introduced over time through trade and further migrations. The cities of Malha and Abu Garan are estimated to have supported population sizes of 6,000 people during a time of significantly higher rainfall in the hills. 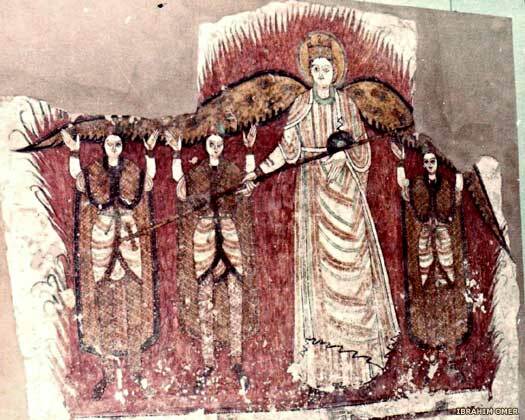 The earliest-known church appears in Nubia, converted from a temple of Isis. The land is once more brought into the orbit of the Mediterranean world by Christian missionaries from the Eastern Roman empire, who are starting to make their way along the Nile and into the Nubian kingdoms. By this time the kingdom of Nobatia/Dongola has converted to Christianity, as has Alodia. But, after the work of the Eastern Roman missionaries has been concluded, the kingdoms sink back into relative obscurity, and only re-emerge in the seventh century. Archaeological work has uncovered some elements of Old Dongola's construction, though. Two main churches are built, termed 'Building X' and the 'Church with the Stone Pavement' by archaeologists. They are positioned just a hundred metres outside the original city walls, indicating considerable expansion in a little over a century of Old Dongola's existence. 'Building X' is soon replaced by a new construction on the same site, the 'Old Church'. Could it be the missionary work in this period that introduces possible Germanic elements into the region and helps to form Alodia? Given Dongola's apparent dominance of northern Nubia at this time, Alodia may be a splinter state, perhaps formed when Subah is seized by a new group who are sufficiently powerful to deny Dongola's authority, although this is just a theory. Egypt is conquered by Islamic armies in 640-641, and Nubia is cut off from the rest of Christianity. The following year, Islamic forces venture south, fighting the Nubians of Dongola at the First Battle of Dongola (perhaps more a series of skirmishes and Nubian guerrilla tactics than an outright battle). The Nubians win the encounter(s), showering the invaders with lethal hails of arrows and halting Arab advances south of Egypt in a rare Islamic defeat for this period. Successfully resisted the Islamic invasion. An invading Islamic army is repulsed at the Second Battle of Dongola, otherwise known as the Siege of Dongola. The Arabs lay siege to Old Dongola, using a catapult to fire into the city. The two main Christian churches, the 'Old Church' and the 'Church with the Stone Pavement', are destroyed around this time, probably by this very means. Nubian resistance is fierce, especially from the lethal archers, and the Arabs suffer heavy losses. No longer able to continue an attack which the Dongolan king, Qalidurut, shows every sign of continuing to resist, the Arab commander agrees a treaty known as the baqt, which ensures peace between Egypt and Dongola until the thirteenth century. Both the damaged churches are rebuilt soon afterwards, but the 'Old Church' also loses material that is taken to patch the city walls. Around the same time, Dongola expands to annexe its northern neighbour, Nobatia (if it has not already done so and if the kingdoms are not one and the same). The use of the names Makuria and Nobatia at some points after this may imply the creation of a dual monarchy. The archaeologist-named 'Church of the Granite Columns' is constructed on the site of the 'Old Church' towards the end of the seventh century. It is a comparatively grand building, suggesting that it might be serving as Old Dongola's cathedral. The succession here is confused, with two permutations available. Alternative dates are shown in red. Despite the poor availability of records to date even its kings properly, the kingdom is known to be stable and prosperous, enjoying a golden age that lasts for about four centuries. Held the throne very briefly. Restored to the throne. Died c.854. A product of Islamic influence or of Arab birth? 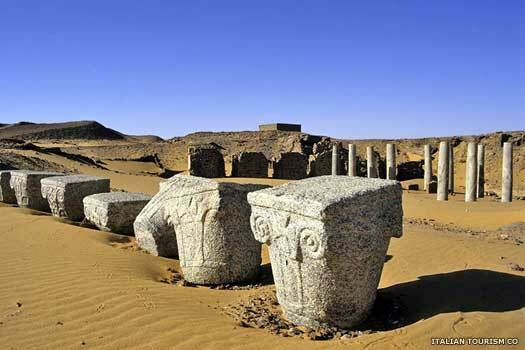 In the south of Nubia another kingdom emerges. Named Dotawo, it has a capital at Dau (modern Djabel-Adda), but it may not be a kingdom at all, merely a colony of Makuria. In Old Dongola, the 'Church with the Stone Pavement' is demolished and the 'Cruciform Church' is built in its place, although many other churches also exist by now. Only the second king with an Islamic influence. Makuria conquers its rival medieval Nubian state at Alodia, uniting two of the region's largest states during the late Nubian golden age. Royal marriages are facilitated with the restoration in the middle of the century of the principle of the son of the royal sister inheriting the Makurian throne. Strong royal authority diminishes in the face of progressing feudalisation, leaving the kingdom in the hands of an extensive group of local dignitaries drawn from the royal family and the state administration. The sons of the ruling king increasingly often became bishops in the church and a number of rulers spend the remaining years of their lives after abdication in monasteries, sometimes outside the kingdom. This obviously does not favour political stability within the state. King Moses George of Dotawo? The kingdom enters a sharp decline, due in part to increased Bedouin attacks after these tribes people have been pushed south by the Ayyubids. Cities have to be defended by new walls, buildings are made stronger, and some settlements are moved to more defendable locations. Control over Alodia is lost and Makurian-Egyptian relations cool. The expedition lead by Saladin's brother against Makuria, which terminates in the taking of Qasr Ibrim and the garrisoning of troops in the fortress there for a period of several years results in growing animosity. The baqt is forgotten. Despite the efforts of Moise Georgios, no peace is negotiated between Makuria and the Ayyubids. The consequences are serious for the Nubian kingdom. Food imports from Egypt are reduced substantially, forcing Makuria toward greater agricultural self-sufficiency. The granary supervisor becomes one of the leading officials in the kingdom. Considerable effort is put in building new fortifications or refurbishing existing but neglected defences. A progressive Nubianisation of church and state administration occurs, with Greek and Coptic losing preference as the official languages in favour of Old Nubian. All of the literature in the kingdom is translated into the kingdom's vernacular at this time. Relations with Alodia are also strengthened, apparently by blood ties between the two ruling families. Forced to flee a Bahri Mameluke attack. A Bahri Mameluke army under the command of Malik Zahir, deputy leader to Baybars in Egypt, is claimed to conquer Sudan. This is an uncertain time for Sudan, with few records to back up any such claim, but David II is indeed forced to flee a Mameluke attack. Whether this attack is a definitive conquest is much harder to say, but it is viewed by Arab sources as a great victory. King George Simon of Dotawo? 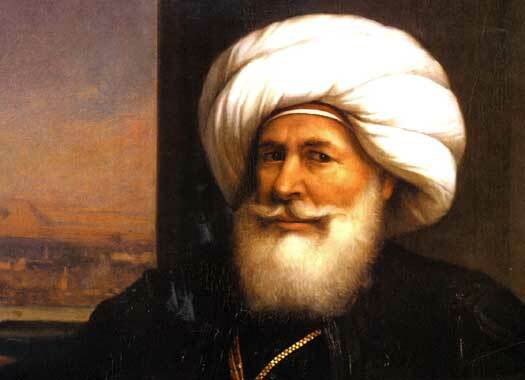 Increased aggression from Mameluke Egypt and internal discord begins the state's fading and collapse. Following the Egyptian sack of Makuria, the native kings are supplanted by Mameluke rulers, although it is not clear if they are puppets of Egypt, governors, or independent rulers. Mameluke rulers are shown in green. Native rulers are restored to the throne of Dongola, but the kingdom's disintegration continues. Officially replaced by a Nubian Muslim. Mameluke client kings from Egypt again secure control of the kingdom. An inscription erected in Old Dongola in 1317 by Saif ad-Din'Abdallah Bershambo is taken as the record of a military expedition from Egypt which places him in command of Old Dongola in the name of Sultan Al-Nasir Muhammad I of Egypt. Mameluke ruler, held the throne for three days. Once again the Mameluke possessors of Dongola are replaced by a native ruler, but it is too late to save the kingdom. Kerembes' hold on power is short-lived, and when he is replaced, he is the last of his kind. The kingdom collapses, most especially due to the aggression from Egypt. It is possible, given the apparent overlaps with Dotawo's kings, that Makuria's rulers flee south to that city which becomes their final bolt-hole. Egypt's interference also sees Arabic speech and religion gradually seep into Nubia over the course of the century, and the region's other medieval state, Alodia, also fades into obscurity and eventual replacement by the Abdallab empire. Egyptian governance of Makuria continues for a while, but that too appears to fade into obscurity, leaving large areas of Nubia either ungoverned or ruled by locals on a piecemeal basis. Old Dongola remains populated until the nineteenth century, when the population migrates about eighty kilometres (fifty miles) to the north, crosses the Nile, and founds (modern) Dongola. Since the early years of the fourteenth century, Nubia had witnessed the gradual penetration of small Arabic groups moving southwards from Egypt with their families. 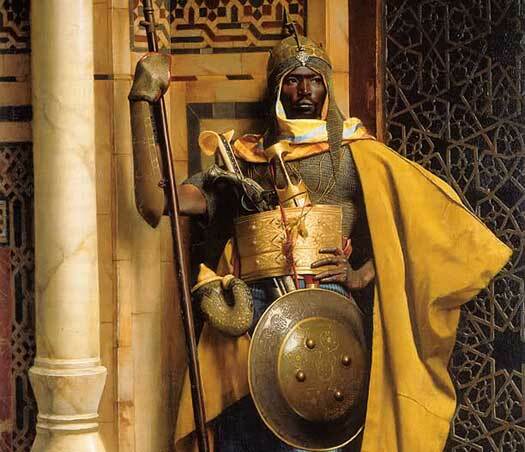 Their influence was such that native Nubian kingdoms kingdoms like Alodia are reputed to have fractured, leaving them ripe for conquest. In time the Arabs formed larger groups with political aspirations and when a leader appeared in the form of Abdullah Jamma, he was able to form them into a unified tribe or confederation. With his new forces under his command, he was able to face one of the sole surviving native Nubian kingdoms, the aforementioned Alodia, capturing its capital at Soba. There he formed a short-lived empire, replacing Christian faith with Islam. Now the Christian kingdom of Dotawo was the last of its kind in Nubia. Some scholars doubt the existence of Abdullah, since 'jamma' means 'the gatherer', an ideal name for an eponymous founder figure. A widely accepted alternate view of the conquest of Alodia has the Arabs joining up with the next wave of incomers, the Funj, to conquer the region without any mention of Abdullah. However, 'jamma' would also seem to be an ideal nickname for someone who has formed a nation out of disparate tribes and families, so it's just as likely that his Arab conquest did in fact take place. Whether he existed or was a replacement for the true founder of this 'empire', Alodia's northern border was maintained somewhere between the Fifth and Sixth Cataracts of the Nile. The Nubian language was extinguished from the south, with only a few place names surviving, while in the north it survived, notably in the Blue Nile region. The formerly Christian Nubians were completely Islamicised, even in Makuria and Nobatia. Founded the empire after conquering Alodia. The Funj have recently been migrating into Nubia from the Sudd, forced out by pressure from the Shilluk people. Once in Nubia, they defeat Abdullah Jamma, absorb his short-lived Abdallab empire, and set up the Arabic-speaking Funj sultanate of Sinnar. This rules the region for three centuries, although other minor states also exist in Sudan at the same time. Nubian-speaking peoples are pushed further north by the creation of the sultanate and its use of the Arabic tongue. Although the name of Nubia is still used to describe North Sudan, the Arabic Bilad es-Sudan or 'Land of the Blacks' slowly gains prominence. The Arab empire, if it ever even exists, is soon threatened by the ingress of the Funj people from the south, and Nubia soon gains another new master. The origins of the Funj people are unclear. Their existence is first recorded in the late fifteenth century when they began to migrate into Nubia across the Sudd, a vast swamp region in South Sudan which was formed by the White Nile. Population pressure from the Shilluk people in South Sudan forced them out of their old homeland. Once in central and northern Sudan, they conquered and absorbed the short-lived Abdallab empire, adopting the newly-introduced religion of Islam as their religion and Arabic as the language of their administration. It was this change in language that also changed the region's name over time from Nubia to Sudan. The state itself was built on traditional African principles. Their sultanate was based at Sinnar (or Sennar), and was also known as the Blue Sultanate (it encompassed the Blue Nile). It dominated much of the northern Nile Valley for the next three centuries (northern and eastern Sudan), although other minor states existed from time to time elsewhere within modern Sudan's borders. It was effectively the last independent kingdom in a region with a long and noble history before colonialism took over. At its greatest extent the sultanate extended from the border with Ottoman Egypt at the Third Cataract, south-eastwards to the Ethiopian highlands and the River Sobat, and from the Red Sea to the east over both branches of the Nile, the Nuba Mountains, and Kordofan to the borders of Darfur in the west. The Funj followed a matrilineal order of descent, claiming descent through the female line of a remote legendary ancestress. A royal court of titled high officials elected the king from among the sons of Funj noblewomen by previous rulers. The society was primarily agricultural, without even a fixed capital at first. Reignal numbering appears to vary between sources. 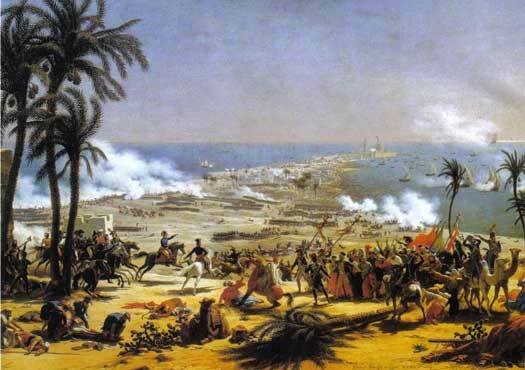 Egypt and Libya are conquered by the Ottoman empire under Selim I Yavuz. In the Funj sultanate, Amara Dunqas skilfully negotiates his way out of further Ottoman conquest, securing his newly-won borders in the process. Son. Deposed by Adlan I. Although he is deposed by his brother, Abd al-Qadir is a friend of the Ethiopian Emperor Susneyos I. At some point after this date, the deposed sultan is appointed governor of Chilga (also known as Ayikel), an important trading town near the Ethiopian border with Sinnar. Brother. Deposed by Badi I.
Emperor Susenyos conquers and annexes the kingdom of Fazughli into the Ethiopian empire, on Sinnar's borders. The emperor subsequently sends priests to renew the Orthodox Christianity of the province, although the missionaries appear to achieve little, seemingly becoming mired in doctrinal disputes. The period of the great kings begins with the reign of Rubat I. These three kings open diplomatic and commercial relations with the Islamic heartlands, establishing at Sinnar the first fixed urban capital for their hitherto agrarian realm. They build this new city as part of a large and cosmopolitan metropolis by dispatching royal caravans to attract foreigners with valuable goods and skills. Unfortunately, these more intimate contacts with the outside world begin to expose features of Funj society, notably the matrilineal descent of its nobles and the royal dominance over foreign commerce. These features inevitably appear controversial from the cultural perspective of Sudan's northern neighbours. Son. First of the great kings. During the reign of Rubat I, the kingdom of Taqali to the west of Sinnar is conquered and made a Funj vassal state. Second of the great kings. Relations with Ethiopia have been deteriorating since the reign of Badi I as the Funj press southwards up the Blue Nile to annexe the gold-producing land of Fazughli. 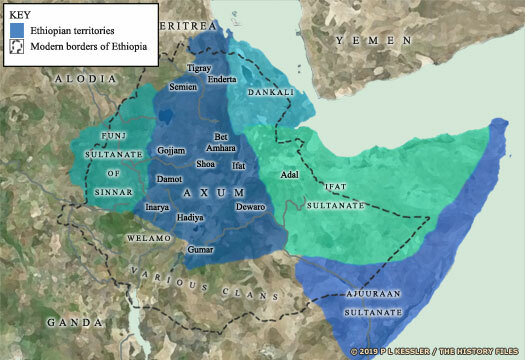 In this period major Ethiopian invasions designed to reclaim the valuable territory and kick out the Funj are repulsed. Third of the great kings. Cultural dissidence expresses itself in the rise of towns, whose numbers increased from one in 1700 to about thirty by 1821, and in accelerating political chaos. The royal practice of matrilineal descent is abandoned in this year. Another Ethiopian invasion takes place. This is part of continuing problems between the two states now that Ethiopian territories border those of Sinnar. An increasingly bitter struggle has been developing between Sinnar and its Fur-speaking western neighbours of the Keira dynasty of Dar Fur over the vast gold-producing region of Kordofan that lies between the respective heartlands of the two kingdoms. In the middle of the century, the Musabba'at, a defeated and exiled faction of the royal family of Dar Fur, settles in Kordofan and uses it as a base for an attempted re-conquest of their homeland. A military strongman named Muhammad Abu Likaylik of the Hamaj launches a coup which overthrows Badi IV. Under the control of this military 'regent', the monarchy is reduced to little more than a puppet. From this point forwards, the Hamaj 'regents' and the military are in control of the sultanate despite attempts by the rightful rulers to dispose of them. To emphasise the lack of control experienced by the sultans, they are shown with a shaded background. Son. Reason for overlap in rule with next sultan is unclear. During his lifetime, the Hamaj 'regent', Muhammad Abu Likayik, had administered the sultanate very well, but following his death there is factional in-fighting amongst his successors and rebellions by the Funj sultans, which hastens the sultanate's decline. The Hamaj military 'regent', Rajab wad Muhammad, is defeated at the Battle of Taras by Sultan Adlan II, although it appears not to change the situation whereby the sultanate is governed from behind the throne. Son of Tabl II. Deposed, probably by Hamaj Idris wad Abu Likayik. A name suspiciously similar to that of the Hamaj 'regent', Adlan. Restored, as true king, without a 'regent'. After arranging a coup on 1 March in which most of the leading Mameluke beys of Egypt are murdered, Pasha Muhammad Ali takes full control of the country. 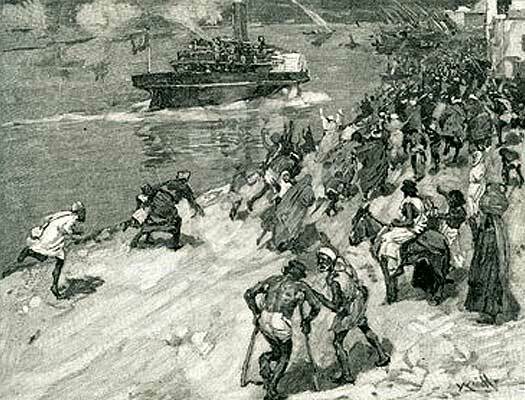 Surviving Mamelukes flee southwards, entering Sudan, where they set up a slaving centre at Dongola. The sultan of Sinnar informs Egypt that he is unable to obey an order to expel the Mamelukes, and this serves as a pretext for the Egyptian invasion of the country. The greatly weakened and virtually defenceless sultanate is destroyed in the process, being formally terminated in 15 July 1821. In return for his meek surrender and handing over the kingdom, Badi is allowed to remain governor of Sinnar itself under Egyptian rule. Bordered to the north by Muhammad Ali's Egypt, Sudan's history had long been tied to its northern neighbour, from the very beginnings of the Nubian kingdom onwards. For much of the nineteenth century, Egypt exercised control over Sudan, either in its own right or as part of a colonial possession. The intention of the khedive at Cairo was to unite the two countries as a single, enlarged Egyptian state, and the Egyptians continued to claim sovereignty over Sudan until the mid-twentieth century, but full union never happened due, in part, to British blocking efforts before the Second World War. In 1820, Muhammad Ali sent his son, Ismail, to conquer Sudan, which he did in relatively short order, destroying the Funj sultanate of Sinnar in the process. Ismail retained initial supreme command of the conquered land before making way for subsequent military commanders. A governor-generalship was eventually established to control the country in Egypt's name. This Sudan should not be confused with the French Sudan of colonial western Africa. Ismail, son of Muhammad Ali had conquered Sudan, destroying the Funj sultanate of Sinnar in short order. Now he retains initial supreme command of the conquered Sudan before making way for subsequent military commanders. A governor-generalship is eventually established in order to control the country in Egypt's name. The Suez Canal is opened, greatly increasing the economic and strategic importance of both Egypt and Sudan. Britain buys the khedive's share in the canal in 1875 (official recognition of the elevation from wali to khedive of Egypt had been recognised by the Ottoman sultan in 1867). Egypt under Isma'il Pasha conquers South Sudan between 1872-1874. The eventual intent is to fully unite Egypt and Sudan as one single state under Egyptian rule. However, a further annexation of 1875 leads to a state of (largely inactive) war with Ethiopia. The Egyptians are defeated and driven back in the first two battles, Gundet in 1875 and Gura in 1876, after which actual hostilities cease. The Sudanese revolt is led by Muhammad Ahmad ibn Abd Allah, the Mahdi (the Guided One), against Turco-Egyptian administration. It quickly gains popularity amongst the disaffected and fractured Sudanese people. The Anglo-Egyptian army under William Hicks is destroyed by the Mahdi's forces at the Battle of El Obeid, commanded by Abdallahi ibn Muhammad. British Governor-General Gordon Pasha, second term. Killed. The death of British Governor-General Charles George Gordon (better known as Gordon of Khartoum) and the massacre of the garrison during the siege of Khartoum causes Britain and Egypt to withdraw their forces from Sudan. The Mahdi is left governing the country as a theocracy. He does not impose Islamic law but does impose a strict rule that authorises the destruction of mosques and the burning of books and lists containing pedigrees. He maintains that his rule must be obeyed completely. 'The Mahdi'. Religious dictator. 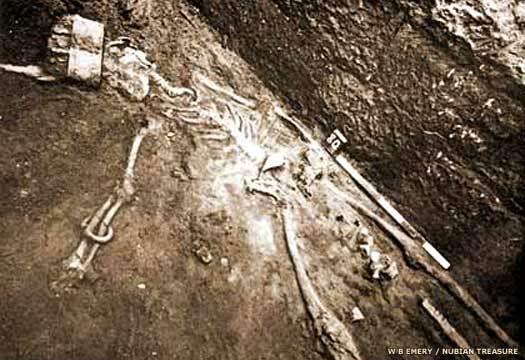 Died of typhus. The Mahdi dies of typhus just six months after gaining control of Sudan. There is a short struggle amongst his deputies to see which one will succeed him. The winner enforces a brutal rule, appointing 'ansars' (helpers) to rule as emirs (princes) over the regions. Khalifa (successor). Captured and killed. A 60,000-strong army under the ansars enters neighbouring Ethiopia. It gets as far as Gondar, the former imperial capital of the Begemder province. The city is sacked, and at the start of 1888 the Sudanese set fire to almost all of its churches, devastating the whole city. In 1889, King Yohannes IV of Ethiopia marches on Metemma in Sudan, but is killed in battle. Ethiopia withdraws. The Khalifa's general, Abd ar Rahman an Nujumi, attempts an invasion of Egypt, but Egyptian troops under British command defeat him in battle at Tushkah in 1889. The failure of the invasion destroys the myth of the general's invincibility and several subsequent defeats are inflicted on Sudanese forces. Belgian forces successfully defend Equatoria from a Sudanese invasion and, in 1893, Italian forces push back an attack on Akordat in Eritrea. The Sudanese are forced out of Ethiopia entirely. A Sudanese warlord and slave trader named Rabih az-Zubayr invades the Bornu empire from eastern Sudan and quickly conquers the ruling dynasty. As Rabah the Conqueror, he rules the empire himself as head of the Zobeir dynasty. The British appoint Major-General Sir Horatio Herbert Kitchener to lead an expedition from Egypt into Sudan in order to quell the Mahdi's uprising once and for all, secure the Nile, and prevent other European forces from making their own claims on the war-torn country. His campaign culminates in the Battle of Omdurman on 2 September 1898 in which the Mahdi army is destroyed by European firepower and organisation. Following the 1898 defeat, an agreement is reached which establishes Anglo-Egyptian rule. Sudan is run by a governor-general who is appointed by Egypt with British consent. First British governor-general following the restoration of power. Last British governor-general prior to independence. The country gains independence from the republic of Egypt and from its colonial overlords in Britain. Sudan is a vast, mainly desert region in north-eastern Africa, with most of its habitation lying along the course of the Nile. It is bordered to the east by Ethiopia and Eritrea, to the north by Egypt, to the west by Libya and Chad, to the south-west by the Central African Republic, and, until 2011, to the south by the Democratic Republic of the Congo, Uganda, and Kenya. The Republic of Sudan was established on 1 January 1956, with its capital at Khartoum, a name which is famous in the annals of British history, as is the name of the country's largest city, Omdurman. One of the largest and most diverse countries in Africa, modern Sudan has large areas of cultivatable land, as well as gold and cotton, and extensive oil reserves. Sudan's name comes from the Arabic 'bilad al-sudan', or land of the blacks. Arabic is the official language and Islam is the religion of the state, but the country has a large non-Arabic-speaking and non-Muslim population which has rejected attempts by the government in Khartoum to impose Islamic Sharia law on the country as a whole. This and other problems have led to widespread unrest in the country in the years since independence was achieved. In 2011, much of this conflict was apparently resolved when the southernmost third of the country split away to form the new, largely Christian country of South Sudan. The revolution in neighbouring Egypt in 1952 overthrew the king (its initial aim) and eventually abolished the monarchy, replacing it with a republic. The monarchy had been seen to be corrupt (a common complaint in the region at this time) and pro-British, but the replacement was a series of military generals ruling the country. With the formation of the republic in 1954, the last ruler of the house of Muhammad Ali, the infant Fuad II, was no longer required and was brought to Switzerland to live with his similarly-exiled father. He retained his claim to the joint throne of Egypt and Sudan, and successive claimants to the throne are shown on the Egypt page with a shaded background. It takes just two years of independence under a sovereignty committee before General Abbud leads a military coup against the civilian government that is elected that year. However, the country is already divided, having been so from 1955 when the First Sudanese Civil War had been triggered by concerns in the south that the north would attempt to dominate the newly independent country. The Anya Nya movement that had been formed from southern army officers continues to fight a guerrilla action against troops of the north. In 1964, the 'October Revolution' overthrows Abbud and a national government is established under a sovereignty committee. Jafar Numayri leads the 'May Revolution' military coup which overthrows the presidency of Ismail al-Azhari. In 1971 the Sudanese Communist Party leaders are executed after a short-lived coup against Numayri. Dictator and, from 1971, president. Died 2009. The First Sudanese Civil War, which started in 1955, finally ends with the Addis Ababa peace agreement between the government and the Anya Nya. Under its terms, the south becomes a self-governing region. There follows a decade of peace in Sudan. President Numayri attempts to create a federated Sudan as a way of working around (ignoring) the Addis Ababa agreement and restoring control over the south. 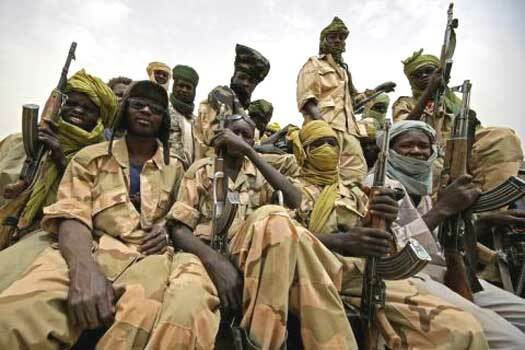 The Second Sudanese Civil War breaks out in the south involving government forces and the Sudan People's Liberation Movement (SPLM), led by John Garang. The situation is made worse when Numayri imposes Sharia Islamic law in the same year. After widespread popular unrest, in 1985 Numayri is deposed by a group of officers and a Transitional Military Council is set up to rule the country. A coalition government is formed the following year after general elections, with Sadiq al-Mahdi as prime minister. The National Salvation Revolution takes over in a bloodless military coup. By 1993, the Revolution Command Council is dissolved after Omar al-Bashir is appointed president. He rules what is effectively an authoritarian dictatorship. Military dictator and, from 1993, self-appointed president. In February 2003, rebels in the western region of Darfur rise up against the government, claiming the region is being neglected by Khartoum. In January the following year, the army moves to quell the rebel uprising and hundreds of thousands of refugees flee to neighbouring Chad. In 2005 a peace deal is agreed which ends the Second Sudanese Civil War, but Chad and Sudan accuse one another of backing and harbouring rebels, and the dispute leads to a four-year break in relations between 2006-2010. At midnight on the start of 9 July 2011, South Sudan officially becomes a new country, divided thanks to a popular vote from what remains of Sudan proper (which still possesses roughly two-thirds of the original state's territory). It is the climax of a process that has been made possible by the 2005 peace deal that ended decades of civil war. Sudan's President Omar al-Bashir is the first to recognise the new country. Its largely Christian capital is Juba, and it is bordered to the north by Sudan, to the east by Ethiopia, to the south by Kenya, Uganda, and the Democratic Republic of the Congo, and to the west by the Central African Republic. Protests about rising prices become violent, with at least thirty-eight people dying. 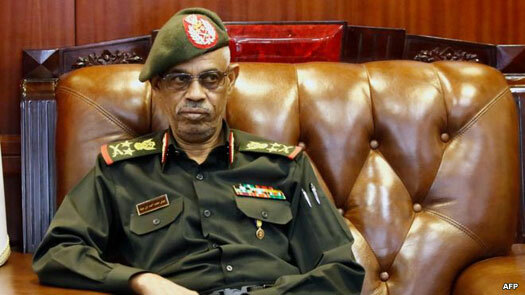 On Thursday 11 April 2019, Omar al-Bashir is removed from office during a military coup. A three month state of emergency is declared and the constitution is suspended but, despite a curfew being imposed, protestors remain on the capital's streets, camping outside the army headquarters in Khartoum. Military general & defence minister. Led coup. Stepped down. One day after leading the coup, General Awad ibn Auf, the former defence minister names his replacement as Lieutenant-General Abdel Fattah Abdelrahman Burhan following claims that the general is too close to al-Bashir.